Product code: ES8355 Categories: Antique, Antique Rings. 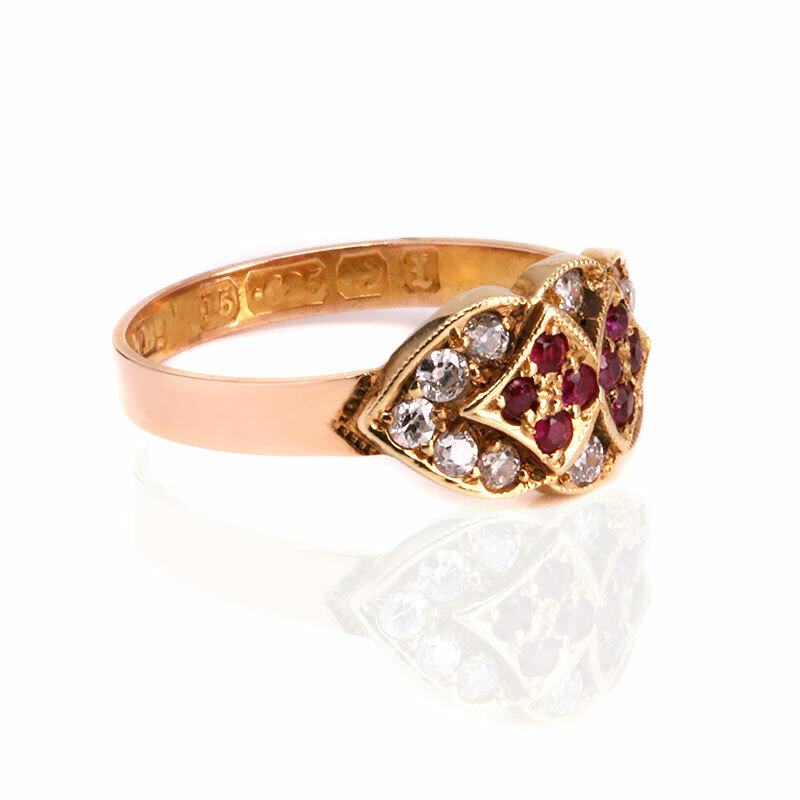 Sometimes the designs found in antique rings belies its age, such as this very attractive 15 carat gold antique ruby and diamond ring that was made in 1880, and will easily blend in with other antique rings or modern rings thanks to its timeless design. The wonderful aspect of having two groups of four rubies in their own section which is then highlighted by the European cut diamond set on each edge as well as the row of European cut diamonds on the sides leading to the band, all come together to create a fabulous design that will always be admired every time that it is worn. The eight rubies come together to total 0.12 carats and the twelve European cut diamond total 0.26 carats, and from left to right the ring measures 14mm by 8.2mm wide at the centre. Sitting nice and flat on the finger, this is a perfect ring to compliment other pieces of antique or modern jewellery and will always surprise people when you let them know that it is close to 140 years old. This antique ruby and diamond ring is set with antique European cut diamonds and Burmese rubies. Hand made in the Victorian period in 1880, it was made i n15 carat gold. 15 carat gold was used for a relatively short time from 1854 to 1931 and often has a lovely soft rose colour to it.